Last November I challenged friends, family and really all Fetal Health Foundation supporters to make a year-end donation that would ultimately serve as a challenge to me to run one mile for every ten dollars donated. I had hoped to enter into 2016 with a monumental challenge of running 500+ miles and I welcomed more with open arms. I was ready. My goddaughter was one of the first to make a donation. Her message taunted my competitive spirit: game on! January 1st arrived and I headed out to participate in a new year’s day 5k. To my amazement, Aspen wanted to join me. One of my TTTS survivors was going to run the first 3 miles of this challenge with me! I was beaming, doing one of my favorite activities with one of my favorite people for my favorite charity. I don’t think Aspen had any idea how special it felt to have her by my side as I ran. She was battling a cough so she struggled through the run. She had to stop and walk a few times but she never gave up. She pushed on until we got to the finish line and tears rolled down her cheeks. 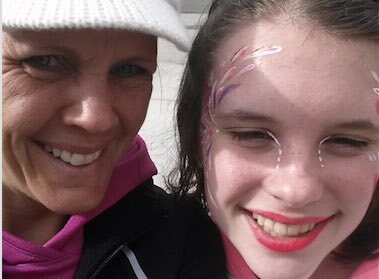 Being with Aspen from her enthusiasm at the start of the run, through the tears as she struggled, I remembered a similar journey parents take when diagnosed with a fetal syndrome. You start out excited to be pregnant but then get the air sucked out of you when you find out there’s a problem. Giving up is not an option. You walk, or jog, or run to find help. You struggle to get answers, you struggle to get to the finish line that often times seems so far in the distance. Thanks for your support. Thanks for being by my side. Michelle’s promised to write again soon, so watch for her next post. If you’d like to join her team of supporters, you can donate here. If you’d like to know more about Michelle and her TTTS survivors, here’s their story.